In my little Italian family we love garlic. Before meeting ( & marrying) my husband, I would have been stingy about how much I added to a dish. Now? It calls for 1 clove? It needs at least 3. It calls for olive oil & garlic? I’m also using my garlic-infused olive oil. The cardinal rule he taught me: You can never use too much garlic. No such thing. My husband eats the stuff by the spoonful. While I can’t go quite that far myself, I really love the pungent stuff. I’m also a recovering cheese addict. Garlic & Cheese, together? Now that’s a beautiful thing! This rich and creamy pasta dish is a match made in heaven. 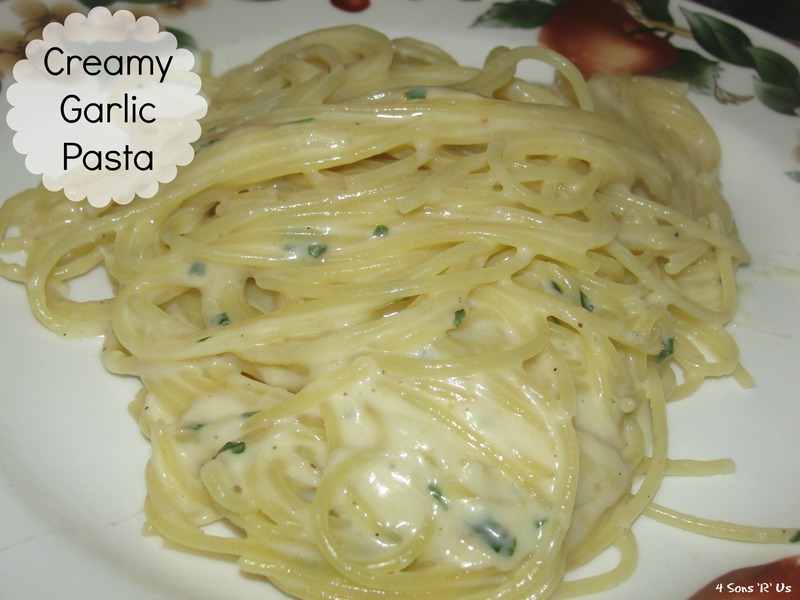 You can be enjoying this delectable pasta dish in a snap, it’s that simple to throw together. The taste is out of this world (and it gives us our garlic fix)! Feel free to top this creamy garlic pasta off with as little, or as much, extra Parmesan cheese as your taste buds desire. I won’t judge you. Besides, if anyone ever tells you you put too much Parmesan cheese on your pasta, stop speaking to them. You don’t need that kind of negativity in your life. 1. In a pot, bring the olive oil to medium-low heat. Add the garlic and stir, allowing it to cook for 1-2 minutes. Mix in the butter until melted. Add the salt, pepper and chicken stock. Raise the heat to high and let it come to a boil. 2. Once it’s boiling, add the pasta and cook for as long as the box’s directions indicate. Reduce to medium heat and mix in the Parmesan until completely melted. Turn off the heat and stir in the cream and parsley. Serve immediately.